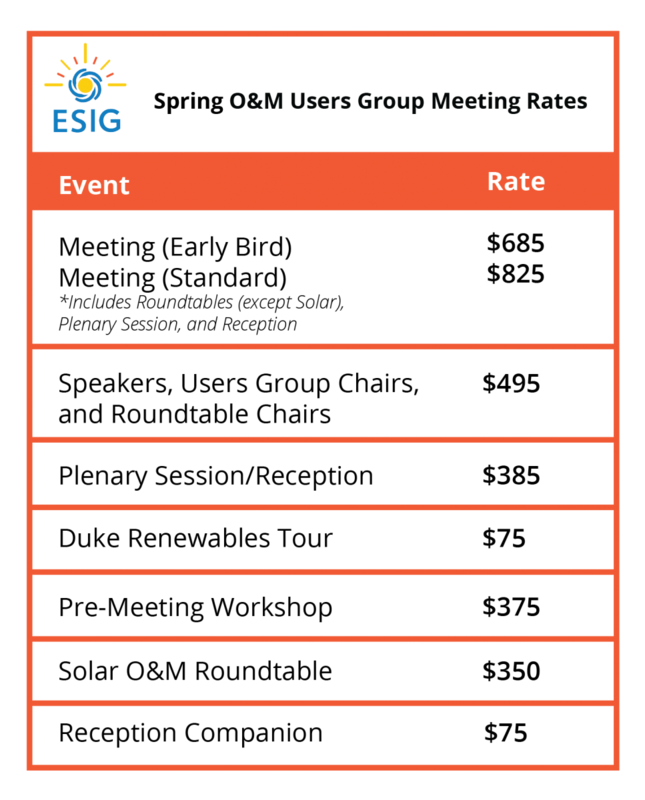 The ESIG Operations & Maintenance Users Group provides an industry-leading forum for people working with wind and solar generation equipment to network, share experiences, and learn up-to-date knowledge on technical topics. By popular demand, the pre-meeting workshop will focus on blades, a topic explored at the Fall 2017 O&M Users Group Meeting. The intent is to move deeper into the topics explored at that previous workshop. More details will be posted as the scope and topics are finalized. The workshop will be followed by a networking reception for participants. Based on feedback from users group members, the plenary session will focus on various topics dealing with the North American Electric Reliability Corporation (NERC). This will focus on NERC Wind GADS reporting. Topics will include current reporting activities and operations, as well as plans and priorities for the short and long term. The heart of the meeting consists of manufacturer-specific roundtables for users group members only. The format consists of open discussions, moderated by roundtable chairpersons, centered on a specific wind turbine component or specific model of wind turbine. The roundtables provide the opportunity for frank and open discussion among users, who share their information, knowledge and experience. Participation in the roundtables is limited to employees of ESIG member organizations that own, operate, or maintain wind generation equipment. The users group also operates roundtables focusing on Balance of Plant and Solar O&M issues. The Balance of Plant Roundtable will be held the afternoon of March 20 and the Solar O&M Roundtable will take place the morning of March 21. The Solar O&M Roundtable requires separate registration. Early Bird pricing will be available until February 28, 2019. The special ESIG room rate is $199 per night (plus tax). The special room rate will be available until March 11. To make your reservation and receive the ESIG preferred rate, CLICK HERE. All registration cancellations and requests for refunds of registration fees must be submitted to ESIG in writing. Requests received by 5 PM Eastern on March 12 – receive full refund. Registrants who have not paid by March 12 will need to make arrangements to pay in advance via credit card or risk having their registrations cancelled. Continuing Education Units will be available to attendees of this event. Information will be available on site.